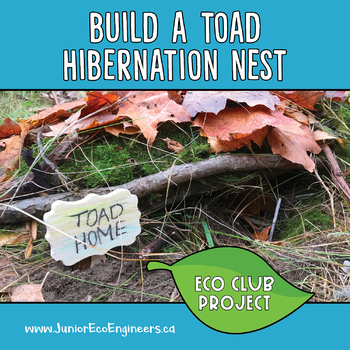 Let your students or Eco Club build toad hibernation nests right near your school yard! It is a great hands on learning, outdoor winter hibernation activity to show your students how they can help local wild life in their area. Also can be used with any hibernation unit. If you plan on purchasing the Frog and Toad Hibernation Unit this is set is included in it. This package is meant to be used for the whole school as part of an Eco Club/Eco Team project to give your students a hands on activity about hibernation with local wildlife. To purchase this for the whole school please just purchase ONE. Please note this listing includes a license for ONE WHOLE SCHOOL.